Article "X-Men: Divided We Stand"
"X-Men: Divided We Stand" is a 2008 comic book story line published by Marvel Comics as a follow-up story line to the "Messiah Complex" story arc. 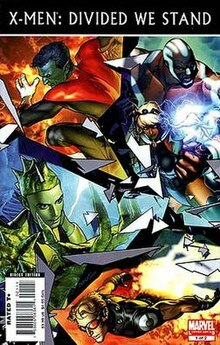 The story started with the issues of the X-Men-related titles cover dated April 2008. This included: The Uncanny X-Men; Wolverine vol. 3; X-Factor vol. 3; and X-Men vol. 2, which was retitled X-Men: Legacy. It also launched three ongoing titles - Cable vol. 2, X-Force vol. 3, and Young X-Men - and a self-titled, two-issue limited series. Each ongoing series ran a separate story arc with "Divided We Stand" providing an overall theme. The arc was followed by "Manifest Destiny". With the team disbanded, Cyclops and Emma Frost have taken a holiday to the Savage Land, but are called to San Francisco by Archangel because a hippie 'goddess' (actually Martinique Jason) has placed the city, as well as Hepzibah, Warpath, Iceman and Archangel, under her control and in a 60s style illusion. Also in the title, Nightcrawler, Wolverine and Colossus are traveling through Europe, when they are captured in Russia by the Red Room and interrogated by someone who wants to know why M-Day has left America with the most mutants and Russia with none. They soon escape and confront Omega Red while in San Francisco Scott and Emma confront Mastermind. They defeat her, freeing their friends and the city, including the mayor, who offers the X-Men a new home in San Francisco. Martinique escapes however, rescued by an anonymous woman, while a headline shows that San Francisco has rejected the Fifty State Initiative in favour of the X-Men. The team is struggling to deal with their own losses, as Wolfsbane leaves to join X-Force. Layla Miller is trapped in the future and Jamie Madrox now bears an M tattoo over his eye. They soon run up against Arcade, who holds Mutant Town hostage while most of the populace contemplates either changing the district's name or leaving altogether. However, an ex-Purifier named Taylor has sabotaged the district and dies, causing bombs to explode throughout Mutant Town. Valerie Cooper is also pursuing Madrox and X-Factor in order to recruit them, an offer that Jamie violently rejects. Siryn has also discovered that she is pregnant after sleeping with Jamie, and intends to give birth to the child. Rictor leaves the team over guilt due to his dealings with Taylor in Messiah Complex. 5 months later, in Detroit, a former mutant comes to the renamed XF Investigations for help, meeting with a heavily pregnant Siryn, while Jamie is found by Cooper, who says that she won't stop until they agree. Cyclops gathers Rockslide, Wolf Cub, Dust, Blindfold and a new character called Ink to fight the new Brotherhood of Mutants, who are apparently now consisting of former New Mutants Sunspot, Cannonball, Magma, and Danielle Moonstar. However, Cyclops may not be who he seems. Blindfold has also had a vision of the team being betrayed and killed while fighting Donald Pierce and Rockslide demands she be added to the team or he won't join, a condition that Cyclops grudgingly accepts. After they fail in training sessions against Brotherhood simulacra, Cyclops sends them after Moonstar and Magma in small teams, each with a specific target. Magma is attacked in Los Angeles and fights back violently, while Moonstar proves superior to the young mutants despite her lack of powers. However, she is taken down by an unseen force. Ink asks Blindfold after the fight how her abilities work before knocking her unconscious. A flashback sequence shows the origin of how Ink got the tattoo that allows him to use telepathic powers. Another flashback shows Cyclops setting up the team of Wolf Cub, Ink and Rockslide to attack the Brotherhood of Mutant members Cannonball and Sunspot. As the attack commences, Cyclops is blindsided by Greymalkin who realizes that Cyclops isn't who he says he is. Back to the members of the Young X-Men, Wolf Cub deals a rather lethal blow to Sunspot who is trying to convince the team that they shouldn't be fighting. This attack causes Cannonball to consider all three Young X-Men a threat. Back at the base, Greymalkin reveals that Cyclops is really the newly reemerged Donald Pierce. The Acolytes have retrieved Professor X's body, which is being kept alive by Omega Sentinel. Exodus heals Professor Xavier's damaged mind while Magneto arrives and clashes with his former disciples. Meanwhile, Sunspot and Sebastian Shaw are clashing within the Hellfire Club over an item in Shaw's possession. Exodus loses a battle to Xavier on the Astral Plane, who then goes his own way to repair his mind. Gambit later comes to defend him from members of the Assassin's Guild. Together they learn the Guild's other targets, including Juggernaut, Hazard and Shaw. Rogue is also wandering the world. It soon becomes apparent that the targets are linked by their connections to Nathan Milbury and the Black Womb Project. Sinister's psychic essence strikes out at them and apparently takes control of Xavier's body while Gambit and Shaw battle the assassins. The new X-Force (consisting of Wolverine, X-23, Warpath and Wolfsbane) are sent after the Purifiers by Cyclops. They soon discover that Wolfsbane's father Reverend Craig is helping them. They have also rebuilt Bastion, who is using Magus to create a 'Choir' of anti-mutant leaders including Donald Pierce, Leper Queen, Cameron Hodge and the reanimated forms of William Stryker, Stephen Lang, Bolivar Trask, and Graydon Creed. Wolfsbane is wounded after being captured by the Purifiers and injected with a large dose of heroin. The team take her to Archangel and Elixir, who help her but she then savagely attacks Archangel, ripping off his wings and taking them to Craig. Using Apocalypse's T-O virus in them, Bastion creates several metal-winged Purifiers. Archangel also grows back his metal wings and regains his blue skin. However, he proceeds to attack his teammates. Meanwhile, in his own title, Wolverine has also been sent after Mystique by Cyclops to punish her for her role in Messiah Complex. As he tracks her, Wolverine remembers his own history with her, ever since they met in 1921. He eventually catches her and manages to fatally wound her after a brutal battle. However, he refuses to kill her and instead leaves her a gun. She manages to survive, and return in Manifest Destiny. Cable has a new title, where he is in the future trying to protect the mutant baby while he is being pursued by Bishop, who desires to kill the child to prevent his dark future from occurring. Cable has recently encountered a much older Cannonball in the future, who says that the four of them are the last remaining mutants. Cannonball defends Cable and the baby as the time-travel equipment is damaged but is killed by Bishop. However, his sacrifice has bought Cable some time to escape. The Free Comic Book Day issue focuses on Pixie as she returns to her old life in Wales. However, her investigation into several missing people leads her into conflict with the N'Garai. Cyclops, Emma Frost, Beast, Colossus, Nightcrawler and Wolverine come to her aid and she is offered a place among the new X-Men team forming in San Francisco after they defeat the N'Garai demons. Gentle returns to Wakanda but is shunned by his people, even his own mother, due to his Russian father. He finds he prefers the New X-Men's company, even though they annoyed him and using his powers has put his life at further risk. Anole, even though he's accepted in his home town, rejects his "normal" life when he realizes that his experiences with the X-Men have left him too violent. Northstar comes to help him adjust but Anole leaves his family, punches Northstar and claims the X-Men ruined their lives by not letting them do normal teenage things. Scalphunter is making a living at a diner in the desert when he is confronted by Nightcrawler, who had appeared to kill him, but decided not to as Scalphunter is merely a clone. He instead tells him to redeem himself and ask for forgiveness before God, as faith is what will stop him being soulless. Scalphunter is later seen wearing a cross, taking the advice to heart. Husk is taking Cannonball back home when they stop for lunch. Cannonball deliberately gets into a bar fight with several members of the Cabot family. Questioned by his sister he replied that he needed a Danger Room. He flies off, leaving Husk behind to worry about his mental state. Hellion awakens in a civilian hospital, where he was transferred. Emma Frost tells him that the X-Men are no more and so he seeks another figure to follow: Magneto. Magneto rejects his service, but tells him to be ready, as mutancy's next war might come sooner than he thinks. Beast returns to the ruined mansion, where he destroys all of the X-Men's files on mutants around the world. He also removes all of their advanced technology. He finally takes No-Girl with him and they leave the ruins behind. Magik is in her castle in Limbo and recounts that she was an impatient child and plots to get her soul back. At first she plans to use her Bloodstone Medallion but changes her mind after remembering the lives it ruined. Instead by remembering her relationships with Shadowcat and Colossus she tries to reclaim her soul through love. She teleports to the Mansion but sees it in ruins. Sad and angry, she resolves to find the missing pieces of her soul through the suffering of those that have wronged her instead. Forge returns to the Eagle's Nest, ruined after the battle between Cable and Bishop. He starts to repair the damage when Bishop returns and takes him out. When he reawakens he finds that Bishop has stolen a robotic arm and all the notes on Cable's time travel device. He tries to rewrite the notes, but fails due to a time paradox. He instead starts to secure the Eagle's Nest against further attack, to prevent himself from being vulnerable again. Havok is on a prison planet in Shi'ar space, listening to the tortured screams of Polaris, Ch'od and Raza Longknife. Vulcan appears on a monitor and taunts him by telling him the events of Messiah Complex. He says the baby, and all of mutantkind's hope, is lost. Havok destroys the monitor and says that if one baby can be born so can another, meaning that there is always hope. Danielle Moonstar is relaxing at her home in the mountains when Surge arrives, having run all the way there. Surge tells Danielle what has happened and how she believes her actions led to Hellion's injuries. Danielle shares her experiences as a New Mutant with Surge and reveals that things will always get better, like the dawning of a new day. Surge replies that every day has a sunset.